LA Food and Wine is not just a big tasting event, but they also hold special lunches, cooking demonstrations and tastings around town throughout the four days. Among this year's events, which are coming up on August 22-25, I'm excited about the Mixology Lunch at Hinoki & The Bird, Asian Night Market with Iron Chef Morimoto, Best of Belgium - Beer and Bites (because I love Belgian beers), a cocktail demonstration with Grant Achatz (I love The Aviary and The Office in Chicago), and Bacon and Bourbon with Chef Edward Lee. Now, back to last year. 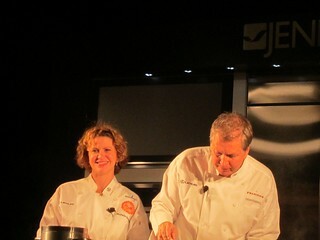 I attended a Southern Brunch cooking demonstration with Chef Dean Fearing from Dallas and Michelle Bernstein from Miami. 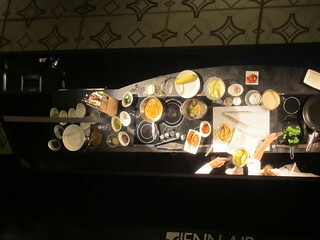 It's hard to see the actual stoves but this mirror above really helped. First Chef Bernstein shows us how to cure salmon. She cured wild Alaskan Cohoe salmon in Jim Beam! I haven't personally tried it but she made it sound pretty easy. 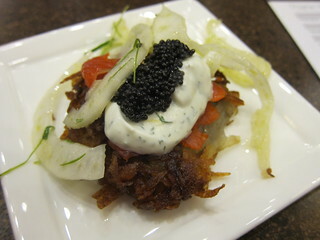 The real process takes about a week so, of course, we ate the salmon she had already cured beforehand, sitting atop of crispy potato latkes and further topped with caviar. What a fancy Southern brunch! 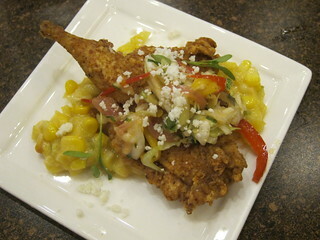 Then, Chef Dean Fearing prepared chicken fried quail with his special spice mix (available for sale), served with some amazing bourbon jalapeno creamed corn and pickled onion and mango slaw. I'm loving the bourbon theme. 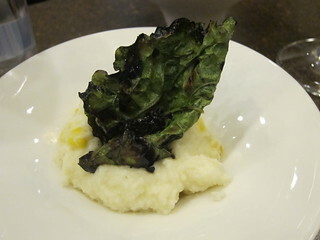 Chef Bernstein's creamy fontina grits with corn and charred kale completed our brunch. I also went to one of the Lexus Grand Tasting events (just like last year, there are two events: one on Saturday and one on Monday). I don't remember which day I went to but I do remember Third Eye Blind was playing. 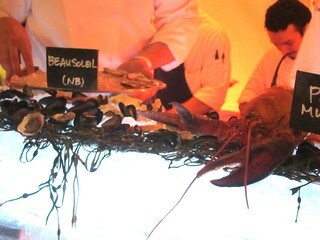 Bouchon brought their A-game with a whole raw bar. Oysters, lobsters, shrimp, and more. Can I just stand here all night? 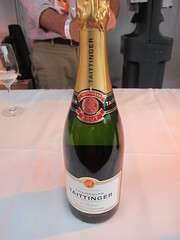 Taittinger was among many good wines there. Opus One unfortunately ran out within 15 minutes of the main event. They apparently were pouring during the VIP session but didn't have any for the main event, which I thought was a bit lame. 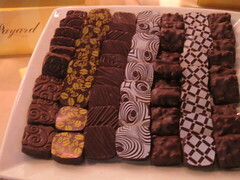 There were chocolates from Compartes and Francois Payard, and boozy popsicles to finish off the night.